On Sunday night past Downpatrick Cricket Club in Downpatrick saw standing room only for Downpatrick FC and Celtic Bhoys Strictly Come Dancing Finale, with over 550 people in attendance. The standard of both the semi-finals was extremely high but this finale’s standard topped both of them by some considerable. The format for Sunday night’s show followed the same pattern with a group dance at the beginning by the semi-finalist couples, then each finalist pairing performing an individual dance. Nerves were a plenty during this part of the show but each couple did themselves proud. This was followed by an interval, which allowed the large audience to add their influence to the final standings. 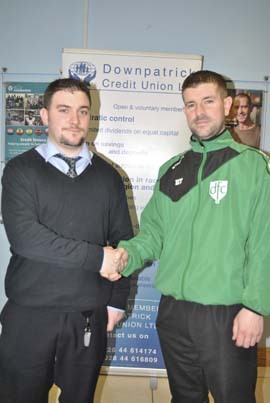 Connor Crane from Downpatrck Credit Union, match sponsor, pictured with Kevin Trueman, first team manager. It was in the second half of the show the night really came alive, during each couple’s second individual dance the crowd were never off their feet supporting each couple and providing merited standing ovations to all the finalists. The standard of dancing in the second half of the show was out of this world and made things very difficult for the judges with all pairings receiving at least one ‘10’ from a judge. After another brief interval it was time for Bruce & Tess to announce Downpatrick’s Strictly Come Dancing winners for 2013. All dancers who had participated in the show were welcomed on stage. 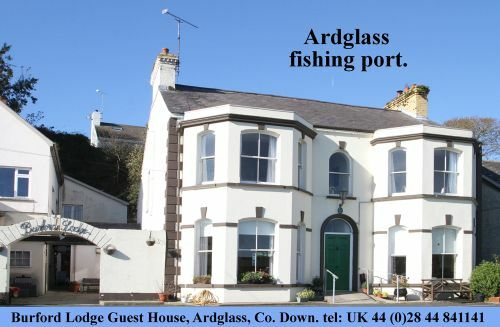 In what was a really close contest, Bruce & Tess were pleased to announce the winners, Roisin Torney & Chris Perry. The winning couple at this stage were mobbed by other contestants and after things had calmed down Roisin & Chris closed the show with one of their dances. The committees of Downpatrick FC and Celtic Bhoys would like to publicly thank all the dancers for the effort & commitment they have given to make this production the huge success it was. The thanks is also extended to all other individuals who played a role in putting on such a memorable and fantastic production which appears to have really caught the imagination of the people of Downpatrick. * Downpatrick firsts played back to back games against Rosario last Thursday and Saturday, unfortunately they struggled in both ties, drawing nil-nil on Thursday and going down 2 – 1 at home on Saturday, especially having gone ahead thanks to a Stevie Galbraith penalty. This match was sponsored by Downpatrick Credit Union. Next up for Downpatrick is home fixture’s against Dundonald on Thursday 9 May and Derriaghy on Tuesday 14 May, both kick offs are at 7.00pm. * The second team signed off on their winning season with a 3-3 draw away to Kirkistown with the goals coming from Paul Brady, Paul Gilgunn & Johnny Kent.